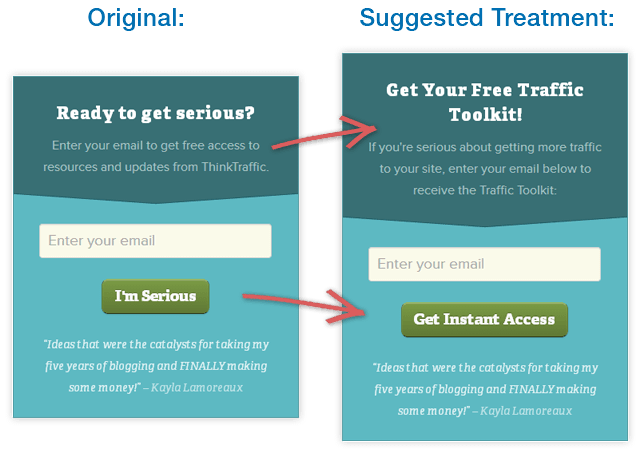 Thrive Leads makes split-testing your opt in forms very easy, but what exactly should you test? How do you create a really compelling opt-in form to begin with? To help answer these questions, let's have a look at some real-life examples of opt-in forms along with suggestions on how they could be improved. Example 1: What’s In It For Them? This first example is taken from the ThinkTraffic blog’s sidebar. The suggested treatments follow one simple principle that you can always rely on, when creating your opt-in form copy: talk about what your visitors can get from signing up. The original opt-in form doesn’t do a great job of explaining what you get for signing up. The suggested treatment focuses both the headline and the button text on the visitor’s benefit. The question “Ready to get serious?” is a qualifying question. Its job is to keep the wrong kind of people from signing up in the first place. My suggestion is to get attention with the headline and then qualify with the next line, not the other way around. What’s extremely good about the form is that there’s a testimonial in it, for some social proof. That’s probably the strongest reason why people sign up and the only thing I’d suggest here is to test several different testimonials, to see which one works best. 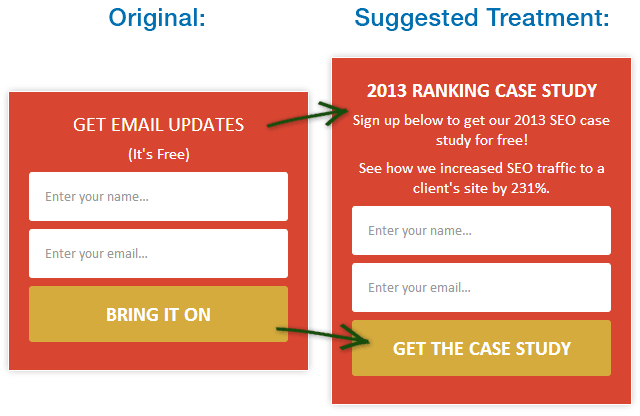 This example is taken from the Sugarrae homepage and it shows that even on marketing related sites, “get free updates” is often the only opt-in incentive presented. Simply offering free email updates or email notifications of new posts will get subscribers on to your list. I’ve always said that it’s better to have a “get free updates” opt-in form than no opt-in form at all. 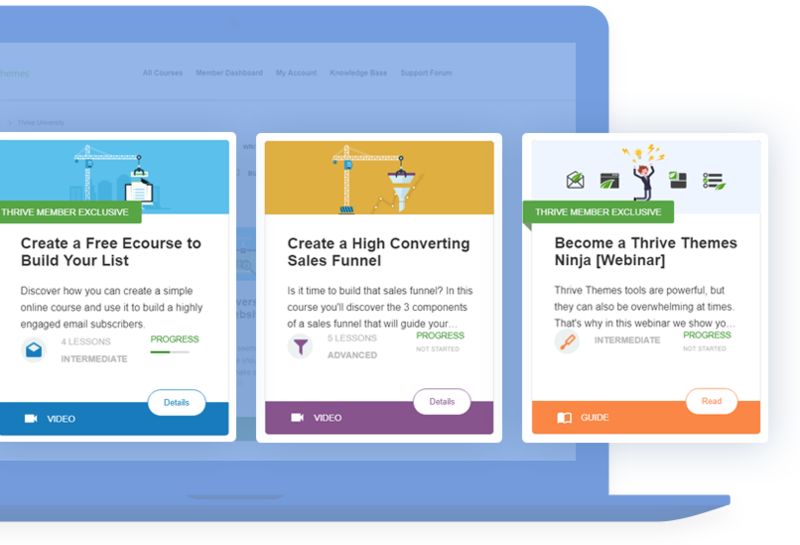 However, this opt-in copy does nothing to convince visitors to sign up, which means all the selling needs to be done by your content. Only visitors who have already read at least one piece of content and loved it will be moved to sign up – and that’s a big, missed opportunity. Offer a desirable opt-in incentive. On this particular website, something like an SEO case study would make sense and fit the context well. Change the text and button copy to communicate what a visitor can get, in return for subscribing. “Get Email Updates (It’s Free)” is technically already advertising an incentive and talking about what the visitor can get. But there’s a problem: free email updates are offered by millions of websites. If everyone’s offering it, it’s not much of a benefit. And most people need more emails in their inbox like they need a hole in the head. Creating a unique and truly desirable opt-in incentive can lead to a massive increase in opt-in conversions, so it’s well worth doing. This example is taken from the Tiny Buddha blog. 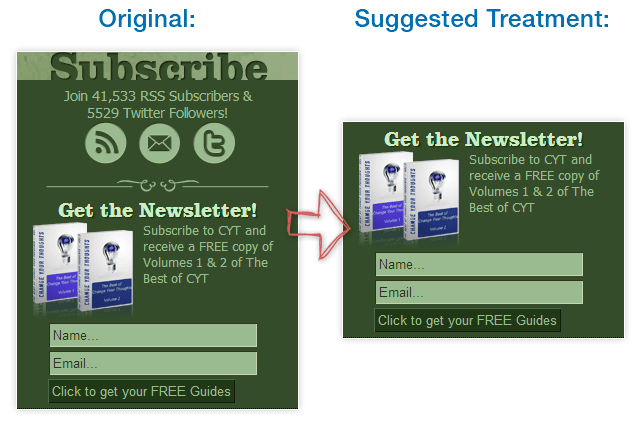 The original opt-in form does many things right: there’s an opt-in incentive, there’s an image that illustrates what the incentive is and the copy very clearly states what the visitor can expect when they subscribe. There are two issues that I’d suggest improving, though. The first is the visibility of the form itself. The original blends in with the background and is easily overlooked. Also, since the input form is blank and the button is small and grey, it’s easy to glance over a page and not even realize that there’s an opt-in form here. My suggested treatment adds a color highlight to the opt-in box (while still keeping with the website’s overall style), adds some helpful text to the form field and makes sure the button is instantly recognizable as a button. The second issue is that the opt-in incentive is a collection of 92 life lessons and the copy advertises the features instead of the benefits. 92 is a large number and unless you communicate the benefits of reading those 92 lessons very clearly, it will just seem like a chore to potential subscribers. Nobody wants to read a big book or long list unless they know what’s in it for them. In the suggested treatment, the copy is changed to highlight the benefits (in line with the blog’s brand message), instead of the features. This example is taken from Steven Aitchison’s personal development blog. As you can see, the suggested treatment is very simple: chop off the top part of the opt-in box. Yes, there are a couple of other improvements that could be made, such as improving the copy and changing the button color to stand out from the background and more. But the main suggestion I have here is to put the focus 100% on the opt-in and not dilute it with social media calls to action. An email subscriber is worth far more than a twitter follower or an RSS subscriber. Visually separate your “social media stuff” from the opt-in form and put a stronger emphasis on the opt-in form. Remove the social media stuff entirely and place it on your thank-you page instead. Get the opt-in first, then invite people to also follow you on twitter, Facebook etc. Always address the visitor’s benefit and what they get in return for signing up. The headline should communicate this benefit. Choose a button color that doesn’t blend in to the background and re-iterate the visitor’s benefit in the button text. Offer a desirable opt-in incentive. “Get our free newsletter” isn’t very interesting. Choose a color for your opt-in box that makes it stand out from its surroundings. Put visual emphasis on your opt-in box. Don’t dilute the focus with too many options and too many choices, especially in close proximity to your opt-in box. Would the suggested treatments all lead to higher conversion rates than the originals? Probably. But we can’t know for sure, unless we actually test. That’s the most important lesson of all: no matter who it comes from, any expert’s opinion is no more than a useful guideline. The only way to find out what really works best and leads to the highest conversion rates for your site, your niche and your readers is to test. Over to you: do you have questions about the examples given here? Want to see more? Have any test results of your own to share? Let us know by leaving a comment! Note: the opt-in form critique offer is now closed. Click here to check out the “sequel” to this post, with reader-submitted opt-in forms! I notice on all of your examples the only info requested is for name & email. I would like to segment my pple into groups – is that a big turn off if they have to add more info or answer more questions? No, that’s definitely something you can also do. In general, you can expect conversion rates to be lower, the more fields or options you add, but the quality of the lead (and what you can do with them) can also increase drastically with added information. These series of guidelines are awesome! Keep it up, Shane. Thank you very much. Can we segment people in the second part of a double opt-in form as an optional feature? Or else, can we just let people segment themselves with an Update Profile Link as a footer in every follow-up email? If I understand correctly you would not want to segment people immediately but give them a choice later on? In this case, the segmentation does not depend on the plugin anymore but will depend on a link in your emails. I’m guessing, depending on your email service this is possible with a simple link.